It wasn’t too long ago that my IRL BFF listed her girl crushes on Facebook. I don’t remember who they were but the likes of Penelope Cruz and Angelina Jolie were on the list, along with funny girls like Kathy Griffin and Tina Fey. When someone poses the question “if you could have dinner with anyone in the world, living or dead” I’m ashamed that people like Mother Theresa, Abraham Lincoln and Martin Luther King don’t pop to mind. I am an author groupie, my girl crushes are on women’s fiction authors. I dream about book signings and having a favorite author follow me on Twitter — or — take a deep breath — find this blog. 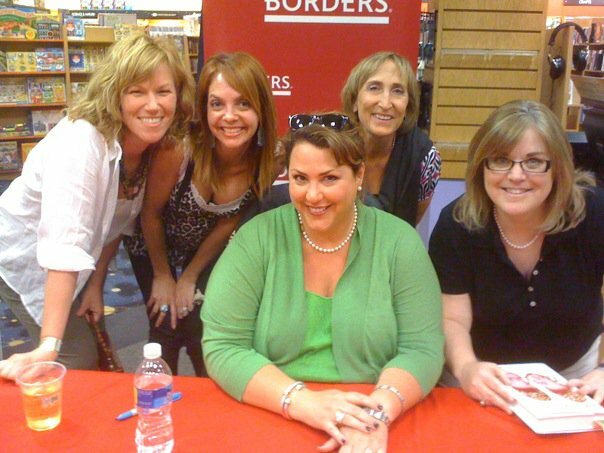 Last spring I dragged asked three of my closest friends to accompany me to a book signing an hour from our little town. On a weeknight. During the school year. Being the amazing friends they are, they not only went with me, but they scored me a seat near the front by rearranging the furniture sheer luck. After the reading and Q&A, they waited in line with me for an hour and a half. I’ll let that sink in for a few seconds. One, two… An hour and a half. And then I got up to the table and was tongue-tied. Me, who is rarely at a loss for the spoken or written word, was star struck. This author was Jennifer Lancaster. And while Jen’s books to date are memoir, they’re written in a women’s fiction tone and her first novel (not fiction novel, just novel) comes out this spring. By reading Jen’s books I learned/was reminded that poignancy and eloquence can go hand in hand with humor and snark. And if that’s not awesomesauce, I don’t know what is. I'm the one on the right. In pearls. Like Jen. If I could pick one person to have dinner with living or dead…I’d pick Jennifer Lancaster. But I will tell you that it would be a really boring meal because I probably wouldn’t talk. My author-on-a-pedestal is Jennifer Weiner. And that’s pronounced like “whiner” not like “hot dog.” I didn’t know that for a long time, which is why I feel it’s ok to correct anyone who says it wrong. I would most likely giggle incessantly if I met Jennifer Weiner. Why? Her first book, Good In Bed, knocked me on my derriere. I was so blown away by a plot twist mid-book that I knew I had to revise my entire book (maybe it was the second draft?) so that I could elicit that type of reaction from readers. I’m grateful – even beholden. Reading Good in Bed showed me how fabulous it is to drop a reader right into the action – no backstory, little lead-up. This was published in 2001, but I didn’t read it until 2007. At which time it led to me making the middle of my book the beginning, the end became the middle and the beginning became a fond memory of what I used to think of as good story-telling. Another friend introduced me to Cathy Lamb. (Hello? Where have you been all my life?) I am reading my fifth Cathy Lamb book and am duly annoyed I have to wait until summer for the next one. What fascinates me about the Cathy Lamb books is how she writes extremely quirky characters whose underpinnings are incredibly normal. She is also a master, in my opinion, of writing a fully developed cast of characters using first person. I was struck by this first in Henry’s Sisters and it inspired me to try my latest WIP in first person. There are many romantic undertones and a smidgen of church in Cathy Lamb’s books, so I wondered if they were 1) romance or 2) Christian fiction. Then I remembered that these books are all about a woman’s journey of self — the details are specific to Lamb, and give the characters heartbeats. It’s good ol’ women’s fiction. Yes, it’s true, I am now a Cathy Lamb junkie seeking rehab. But just until August. I don’t mean for this blog or this post to be about an author popularity contest. These are my go-to writer-gals because I want my books to be like their books — in quality, in story, in tone. I admire many writers, male and female. I read many books — not all women’s fiction. I read a lot of literary fiction and some historical fiction and all good books are teaching tools for aspiring and published authors. I also know a lot of aspiring authors. I’ve read a lot of great drafts of one-day-to-be-published books. I didn’t write this to leave out anyone, but simply to highlight these four authors, for now. We take away from our best teaching books what we need for our own growth as story sculptors. That is the gift of one writer to another – the lesson not in the story, but in how the story is told, how the words are used, how the sentences are constructed, how the cadence is artfully managed. These writerly lessons are like the french fries left at the bottom of the bag after you’ve finished your entire shouldn’t-really-be-eating-this-junk-food lunch. Something you didn’t expect to find — but are really, really glad you did. Jennifer Weiner (queen to us all, I think) I’m reading FLY AWAY HOME right now as a matter of fact. Will check out Cathy Lamb. Thanks! Love Allison Winn Scotch. I read her first book before she was a NYT best seller! And her blog is really wonderful and Allison is always helpful to aspiring authors. My girl crush is Emily Giffin. Some say what she writes is considered chick lit, others women’s fiction. To me, chick lit is quirky, funny, witty and a little outrageous…like Sophie Kinsella’s Shopaholic series. In tone and voice at least, Emily Giffin seems to write more along the lines of women’s fiction. While her characters typically end up with a guy by the end of the book, they ultimately have to save or discover some part of themselves along the way. I choked up quite a few times reading her Something Blue. I aspire to infuse the kind of raw emotion and heart into my books that Emily Giffin infuses in hers. From your description, Emily Giffin sounds to me like a women’s fiction writer…I’ll have to check out her books. Any one in particular you recommend? I agree that Sophie Kinsella’s Shopalic Series is chick lit. And like I’ve said, I <3 me some chick lit — but it's not what I set out to write. I’ll have to check out some of the authors you mentioned above and add them to my to-read pile, too! I’ve heard quite a bit about Jennifer Weiner (and even follow her tweets), but haven’t gotten around to reading her yet. Oh, gosh. As far as Emily Giffin goes, you’d have to start with Something Borrowed (woman hooks up with her self-absorbed best friend’s fiance but feels horribly about it) to really get into and be able to sympathize with the self-absorbed friend’s tale in Something Blue. I’ve also read Giffin’s Love the One You’re With (woman considers cheating on her husband with her college sweetheart), but I didn’t fall in love with that one as much as I did Something Borrowed. I just purchased her newest release, Heart of the Matter and can’t wait to dive in. Yes! Start with Something Borrowed. My favorite of Giffin’s for sure. It’ll be a movie soon so get going on that one. And Ashley–You’re in such a great with Jennifer Weiner! I am SO jealous. I would love to meet Jen Lancaster! I would probably clam up for fear of saying something real dumb. I’m glad I’m not the only one. My friend actually spoke up, told her I’m a writer etc (which was embarrassing). Some people go up and just start chatting away. Not me! Given another chance I’d go with something prepared — and very witty!! Your comments are so spot-on … especially that “All good books are teaching tools for aspiring and published authors.” Yes! Yes! Yes! I also love to read debut women’s fiction — for the same reason you do. I want to see what’s being published today. I also like to watch Publisher’s Marketplace and keep my eye on other places that announce new book sales, because what’s coming out today sold two years ago — and I want to see what’s selling. I will have to check some of those authors! I loved The Murderer’s Daughters, and Randy Susan Meyers is a very wonderful writer-friend of mine, who has been very helpful to me. I’d consider TMD literary fiction, would you? I also read a lot of literary fiction and garner different lessons from those books than from women’s fiction. I smell a new blog post coming!!! I think it would be fun to dissect what we’ve learned from certain books that help us with women’s ficiton. This leads me to wonder: is there another sub-genre called “women’s literary fiction” or is that simply “women’s fiction?” Given your definition of women’s fiction and my understanding of literary fiction, I think this is where my heart lies… Though I’m still not sure! Bring on the additional posts! Woo hoo. How FUN that Randy is a friend. You are well-connected in the writing world, my friend. I struggle with this too — and have been told/it has been suggested that using the term “up-market” (never sure if that needs a hyphen) refers to those books that straddle the commercial/literary line. Meaning it’s very accessible but there is attention to prose, phrasing, description etc. To me there’s commercial women’s fic and more literary women’s fiction — but because I only have so many compartments in my brain, I usually lump them together. I really think of women’s fiction as books that appeal to women almost exclusively. I think a book like Randy’s has mass appeal. Another book that comes to mind is Susan Henderson’s UP FROM THE BLUE. It has a female protagonist, but it’s lit fic to me — appealing to everyone. When I think of my own novel and my WIP – I’m pretty sure the only men who will read it are the ones related to me — or my very closest male friends. I agree with you that there’s commercial WF and literary WF (I am 100% on the literary side in my preferences). Thanks for mentioning Henderson’s book. WIll add to my TBR pile which grows and grows and grows. I was thinking about women’s fiction and wondered about some male authors who write for female audiences specifically – and I assume THEY consider themselves writers of women’s fiction: Nicholas Sparks, Chris Bohjalain (Maybe another post/topic? :-). OK – will leave you alone now, but appreciate the dialogue! Happy writing. Ah! Don’t leave me alone! I’ve been talking to myself long enough! I think it would be great to look into some male writers of women’s fiction — I think I tend to read women authors mostly — so they’re not on my radar. My bad! I have also been told that “book club fiction” is a term that works for my book. That’s easier to understand for me than “up-market” which always reminds me of grocery shopping! I’ve added a lot of great books to my list–so many really great ones out there! Thank you! I’m also a huge fan of non-fiction (I know, it’s a fiction blog, but…), and my latest favorite is Marilyn Johnson who wrote This Book is Overdue! about librarians. Loved it! I love learning about all authors! We write women’s fiction but we can enjoy and learn from all kinds of books, don’t you think? I find I enjoy historical fiction — really what I’d consider women’s historical fiction. I recently read The Lost Summer of Louisa May Alcott and absolutely loved it. A book about librarians seems appropriate reading for all writers! I’ve recently discovered Sheila Roberts. I love her books. “Love in Bloom” and “On Strike for Christmas” have been my favorites so far. I’ll have to check out Sheila Roberts. So many authors, so little time! Thanks for stopping by, Savannah! Also recently purchased The Weird Sisters, The Last Will of Moira Leahy and awaiting release of The Bird Sisters. Eager to read all and couldn’t agree more about reading debut authors. The interesting thing about my completed novel is that many of my best readers/critiquers in the crit group I was in were men. So, I like to think that men trying to get a deeper understanding about the women in their lives could benefit from reading the genre 🙂 :). Oh, and agree, I’ve seen “up-market” most often used for WF that leans toward literary. So enjoying these posts and comments! I agree that men could benefit from reading women’s fiction. Would love to learn about your experience with this from your crit group. My agent is a man (Jason Yarn, The Paradigm Agency) and I only queried a few men. I really thought it would be a woman who’d most connect with my story. Maybe there’s a blog post in there too! I’ve never heard of Kate Chopin — must check her out too! Would love to chat about my crit group experiences! Also, check out Kate Chopin’s “Story of an Hour”. It’s one of her best shorts and available on the web to read. She got a lot of negative feedback when she wrote Awakening because she was ahead of her time on themes, I believe, but she writes about women beautifully. Cat, I’d love to interview you and post it here – maybe something about male critique partners for women’s fiction – a friend or foe angle – if you’re game. Give it some thought! Would love to find male readers and/or writers of women’s fiction to chime in as well. Will add it to my never-ending “to-do” list. Sounds great, Amy. Send me a DM and we can chat about it. Happy Saturday! wonderful information!Thanks For Sharing this post.